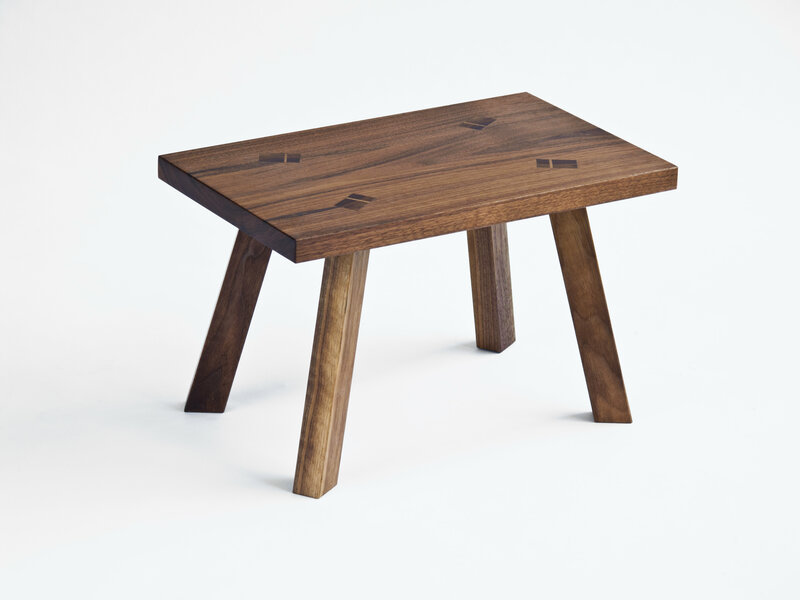 The small Phi Stool is a study on a classic form, featuring angled legs with wedged through-mortise-and-tenon joints. Perfect as a step stool or as a seat for a kid's table. The collection is offered in solid Walnut, Ash, or White Oak. Built with traditional joinery, our pieces are made by hand and finished with a zero-VOC oil finish. Our furniture is made with love in Los Angeles, California. Each piece is made to order. A 50% down payment is collected to begin construction and determine a completion date. The remaining 50% will be due prior to shipment along with applicable shipping charges. Sales in California are subject to a 9% California State Sales Tax. Payments may be made by cash, check, or major credit card. Base 10 furniture is crafted to be enjoyed for generations. Solid wood is a living material that will continue to respond to changes in humidity. The ideal relative humidity for wood furniture is between 30%-60%.Patina will also occur as the wood continues to mature with exposure to daylight, air, and oils from handling. We recommend periodically moving fixtures and objects placed on the furniture to allow for a more evenly aged patina. Our furniture is finished with a hand-rubbed oil finish. For ordinary upkeep, dust with a dry, soft cloth. Wipe up spills or moisture immediately. Do not apply waxes, or clean with conventional store-bought cleaners, as they can degrade the oil finish. For more than light dusting, we recommend occasionally wiping down with a dampened cloth or using the “Natural Soap” available from Monocoat at www.monocoat.us/natural-soap We hope you will enjoy your furniture for years to come. Please email Lindsey Muscato at info@base10furniture.com for a press kit and images.